If the word FYRE doesn't mean anything to you at this point, it’s clear that you have been living under some sort of large rock… a boulder perhaps. Maybe you somehow missed the Fyre mayhem back in 2017, but now it seems that everywhere you turn, you see Fyre. 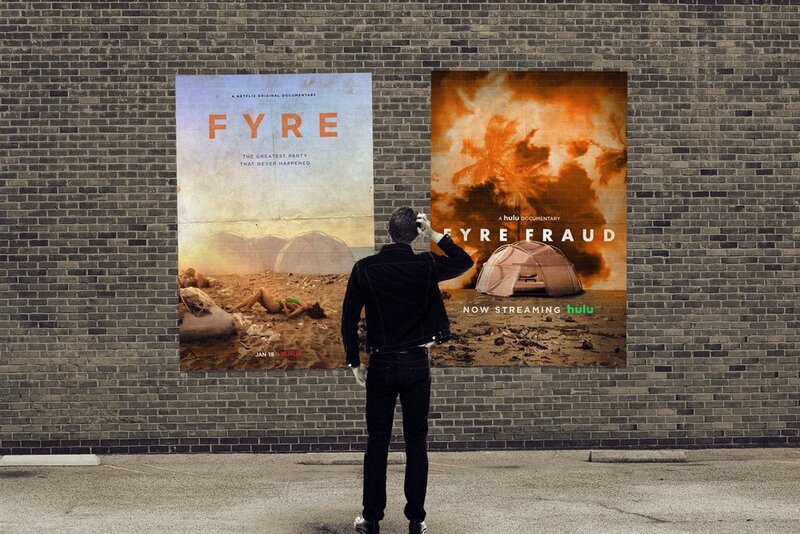 The sudden influx in Fyre fuel comes, obviously, from the release of not one, but TWO documentaries - Fyre Fraud and Fyre: The Greatest Party That Never Happened, released by Hulu and Netflix, respectively. My original interest in Fyre Festival came from their heavy use of celebrity Influencers. (After all, Influencer Marketing is kinda my thing.) In fact, their marketing plan consisted almost entirely of Influencer Marketing. They used these celebrity Influencers as models in promotional videos and photo shoots and to announce all major festival details - including the now infamous orange tile post, disrupting newsfeeds and introducing the masses to Fyre Festival. If there were only two things that should be learned from Fyre Festival and the documentaries recently released, it’s that Influencer Marketing is POWERFUL - perhaps more powerful than people want to give it credit for - and that it can be both a blessing and a curse to Brands and Consumers. These documentaries, however, can teach us a lot more than two things, in fact, I can talk about six …. 1. Influencer Marketing is one of the most effective and powerful forms of Marketing available to Brands. Some believe that Fyre Festival was an Influencer Marketing fail. That it burned the concept of Influencers. While the outcome of the festival was far less than ideal, Influencer Marketing did exactly what it was meant to do - promote a Brand. Promote a lifestyle. Evoke action. Fyre went from an idea to a phenomenon solely based on the promotion done by celebrity Influencers like Kendall Jenner, Bella Hadid and Emily Ratajkowski, to name a few. Currently, over 1/3 of the millennial and Gen Z population has stated that they trust the words of an Influencer over that of a Brand. The Fyre marketing team took this stat and ran with it. Producing social video content using these in demand Influencers was all they needed to craft a narrative of exclusivity and luxury. The simple orange tile, posted by 400 Influencers with millions of followers each, leading to a promo video amassed over 300 MILLION impressions in just 24 hours. If you can’t call that a successful Influencer Marketing campaign, you may need to revisit your definition of success. 2. Influencer Marketing is a long term relationship, not a one-night stand. When the concept of FlipperSplash came to light, one of the questions we got (frequently) was “So, is it kinda like yelp?”. Our response? Yelp is a one-night, FlipperSplash is a long term relationship. What does this mean exactly? Allow me to explain … The relationship between Brand and Influencer should be just that, a relationship. We aimed to cut out the agency aspect of Influencer Marketing to give Brands and Influencers a platform to communicate openly with each other. To discuss the Brand, the promotion, the goals, etc. This open line of communication not only rules out any miscommunication that comes with an agency “middle man”, it allows Brands and Influencers to discuss any issues that may arise and address them together. That’s what happens in a relationship … or so I hear. This is one place that Fyre Festival fell short. By using celebrity Influencers for paid posts, Fyre Festival set themselves up for some one-night stands, sure to leave someone with bitter feelings of discontent. In this case, unfortunately, the consumers were the ones left with bitter feelings … and much thinner bank accounts. Once the chosen Influencers posted the orange tile, their job was finished. There was no need to follow up on the festival (or lack thereof) because they had been paid to do a job, they did it and now they were free to move on with their lives. No accountability. 3. Micro over Macro over Celeb. If you’ve read anything I’ve ever posted on behalf of FlipperSplash, you know how I feel about micro, and even nano, Influencers. I think they are the best. They deliver genuine, well curated content and have real followers engaging with their posts. In fact, I’ve noticed our Influencers with less than 5K followers are often getting equal, if not more post engagement than Influencers with 4 to 5 times the amount of followers. Now, to be clear, this isn’t always the case. Some of the fashion Influencers we work with have followers in the tens of thousands and deliver some of the most genuine content I’ve seen. My point is that numbers don’t always mean success. The MILLIONS of people reached by Fyre Influencers were sold on an idea that never came to fruition. In a sense, they were bamboozled by celebrities who wanted to cash a check, not attend a festival. The FTC is clear on the rules for Influencer Marketing. Influencers must explicitly state that their post is sponsored. If you weren’t sure about the importance of this type of transparency before, the fire that Fyre Festival started should clear that up for you. Of the 400 celebrity Influencers that promoted for Fyre Festival, Emily Ratajkowski is one of the only ones to include #ad in her post. The lack of transparency in this campaign easily led followers to believe that these were not paid promotions, but genuine content about their idols attending the exclusive Fyre Festival. When things started to come to light about potential “Fyre Fraud”, this demographic turned back to these social Influencers for guidance. The trust in social Influencers was so strong in fact that when one skeptic created the @firefraud Twitter account and even went to the New York Times, who published a story on all the facts pointing to fraud, warnings fell on deaf ears. Coincidentally, around the same time the fraud fire started to ignite, Kendall Jenner stepped in with a post about G.O.O.D. music entering the festival lineup. That quick, all talks of potential fraud fell to the wayside and the excitement of festival goers was reignited. If you’ve watched the documentaries or read the article, at one point you’ve probably found yourself thinking “how did these people fall for this?”. I know I thought it a million times when Fyre hit the fan. Then I saw the documentaries and I get it (kinda). While I’d like to imagine that I would have seen and respected the red flags, I’m just not sure I would have. Why? Two words: promo video. If you can sit here and tell me that watching social celebs riding jet skis, swimming in crystal clear water, partying on a yacht and sipping frozen drinks wasn’t even the slightest bit appealing to you, I’m inclined to call your bluff. Not only were you seeing this amazing scene, but you were being promised that you could have it also (to the tune of several thousand dollars, but still). This fantasy lifestyle became attainable in a way it never was before. The goal of an Influencer is, first and foremost, to sell a lifestyle. You have to appreciate their lifestyle in order even have interest in the clothes they’re wearing or the products they’re buying or the services they’re using. Right? Right. This is where Influencer Marketing can be misleading and sometimes dangerous. (Hence the whole transparency thing). By selling this lifestyle and alluding to the fact that festival goers would have the same experience, hundreds of consumers not only lost money, but were thrust into a dangerous situation. 6. Do your due diligence. As an Influencer, one of the most alarming parts of the documentary had to be the festival’s unmet promises to Influencers. In one part, in particular, insiders mentioned that social Influencers were promised lavish villas THAT DIDN’T EVEN EXIST. The intentions were great. Festival founders surely had only the best in mind when they sketched up the Influencer villas. Just one problem … the villas didn’t exist and there wasn’t enough time or money to make them exist. Influencers boarded an outdated 737 when they were promised a private charter plane. They slept on bare mattresses in FEMA tents when they were promised villas. They ate a slice of cheese on bread when they were promised meals suited for royalty … social royalty anyway. This should be a lesson to Influencers about doing the proper due diligence on a Brand before agreeing to a partnership. Certainly no Influencer could have anticipated such a nightmare, but a bit of research could have gone a long way. This isn’t the first time that an Influencer has found themselves affiliated with a Brand that may tarnish their good name - likely because they read the black and white and didn't think much else of it. Similarly, Brands should do proper due diligence when working with Influencers. If you see that an Influencer has 10K followers, but only averages 10 likes on their images, it’s likely that their followers are not genuine. Do your due diligence and avoid having to put out fires of your own. While most of these points are things i’ve known, believed and essentially shouted out to everyone I know, Fyre Festival really drove the points home. While it’s a shame that this information had to come at the tail end of such a huge failure, I love seeing the attention it has brought to Influencer Marketing. Brands and Influencers alike can use Fyre as a tremendous learning experience that will guide them as they continue working with each other. Influencer Marketing is not going anywhere. In fact, it’s getting more prevalent every day. As social media strategist Vickie Segar stated in Fire Fraud, “Influencer Marketing is the most important form of marketing for an entire generation.” Which means Fyre Festival shouldn’t teach you to run from it, but rather embrace it and use it correctly. Build relationships and use those relationships to ignite a positive fire for your Brand. Let’s fight the heat that Fyre Festival brought on Influencer Marketing with the fire that makes it one of the most effective forms of marketing available.